Today I found out AstroTurf was originally named “ChemGrass” before being used by the Houston Astros Major League Baseball team in the Astrodome. 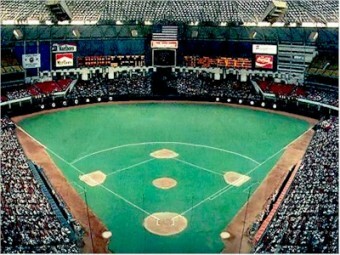 Contrary to popular belief, AstroTurf was not first used or invented for the Houston Astros. For instance, before being used by the Astros, it was used at such sporting venues as Moses Brown School in Rhode Island, among others. AstroTurf was actually originally invented in 1964, two years before the Astros would use it, by Donald L. Elbert, James M. Faria, and Robert T. Wright, working for Monsanto Company. At the time, a subsidiary of Monsanto, Chemstrand Company, was developing synthetic fibers for carpeting and they decided to try their hand at also making an artificial playing surface for sports that wouldn’t require the extensive maintenance typical grass surfaces need when heavily used, as many sporting surfaces are. Such an artificial grass surface would also be able to be used year round in nearly any climate. In 1965, the Houston Astros organization began investigating artificial surfaces for the Astrodome baseball field. Originally, they attempted to use a special type of natural grass on the indoor field. Unfortunately, the semi-transparent ceiling panels didn’t let in enough sunlight and all the grass died within a few months. This resulted in the Astros organization having to paint the dirt field green, to make it appear more like a normal baseball field. By the start of the 1966 season, the Astros decided to go with the relatively new ChemGrass. Due to there being a limited supply, though, they were only able to get the infield covered with ChemGrass for the first half of the season. The outfield was still just painted green dirt. Shortly after the All-Star break, the entire field was covered in ChemGrass and this artificial surface received national attention for the first time. This media attention after being successfully installed in the Astrodome was largely responsible for ChemGrass becoming popular over other similar synthetic grass surfaces being created around that same time. Relatively shortly after being used in the Astrodome, other sporting teams began picking ChemGrass up, even some for outdoor stadiums, particularly those in colder climates where maintaining real grass can sometimes be difficult during spring, fall, and winter months. Because ChemGrass became popular thanks to being used in the Astrodome, the product was subsequently renamed “AstroTurf”, by John A. Wortmann, an employee of Monsanto Company. By 1987, AstroTurf had become so popular that Monsanto Company made it an independent subsidiary of their company, named: AstroTurf Industries, Inc. When ChemGrass was first installed in the Astrodome, the groundskeepers would dress up as astronauts between innings and use vacuum cleaners to keep the turf clean during the game. The backyard in the Brady Bunch TV show used AstroTurf instead of real grass. AstroTurf eventually became unpopular in outdoor fields, despite the cost benefit, largely due to the extra wear on player’s bodies. It is typically installed over cement and provides little cushioning compared to real grass and dirt. Another interesting drawback of AstroTurf in outdoor fields is that it gets exceptionally hot. Particularly in warm weather areas, like Kansas City, the field would get hot enough to melt player’s plastic spikes and, in the case of metal spikes, would burn the player’s feet through their shoes after heating up the metal spikes. The Monsanto Company also is the creator of the popular weeding chemical “Roundup”. In addition to this, they are one of the world’s largest producers of genetically modified grass seed. Monsanto Company was also the first company to mass produce LEDs in 1968. During this same era, they were one of the largest producers of Agent Orange, controversially used by the U.S. military during Vietnam. In 1982, Monsanto Company became the first to successfully genetically modify a plant cell and were the first to produce genetically engineered crops. AstroTurf eventually lent its name to the political and business term “AstroTurfing”, where a business or political group will attempt to create an artificial “grassroots” movement to sway public opinion on some topic by making people think “regular” people are behind the movement. The term “AstroTurfing” was first used in this way by Senator Lloyd Bentsen of Texas in 1985. The Working Families for Wal-Mart group is one example of AstroTurfing. The group presents itself as an independent organization advocating Wal-Mart, but was, in fact, started by Wal-Mart, with Wal-Mart paying Andrew Young, the former mayor of Atlanta, to start and head up the organization. Another corporate AstroTurfing campaign was in 2008 during the FCC hearing involving Comcast’s shady, and possibly illegal, network management practices. Comcast hired people to fill the seats of the hearing, so that few with anti-Comcast viewpoints would be able to attend and it would then appear that most “ordinary” people were backing Comcast. In an extreme, and slightly disturbing, case of AstroTurfing, the U.S. government itself hired HBGary Federal in 2011 to develop special AstroTurfing software that would help the government sway public opinion on various topics. Among other things, the software would scan for online articles written by people with opposing views to what the government wanted people to think. It would then create fake accounts and automatically post made up discrediting information about the authors of those articles. Currently, over 160 million square feet of AstroTurf is being used on sporting fields and for home use worldwide.